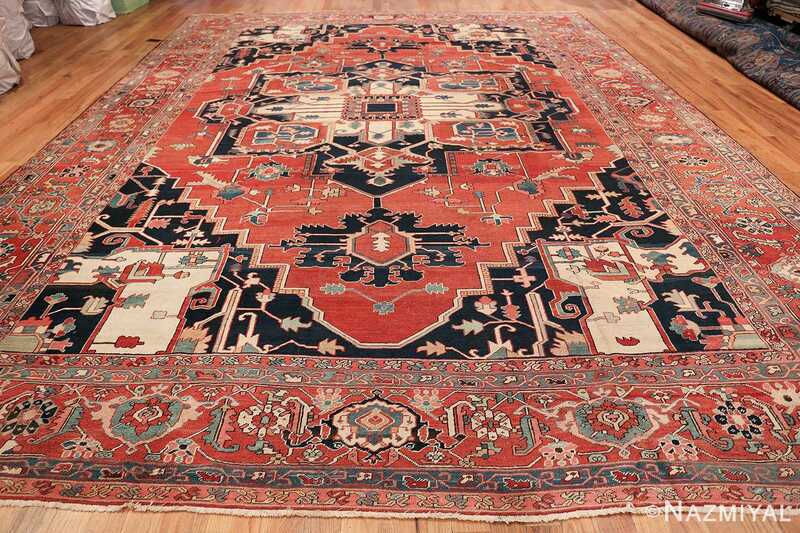 Breathtaking Large Antique Persian Serapi Rug, Country of Origin / Rug Type: Persian Rug,Circa Date: 1900 – The vibrancy and energy of the tribal communities of Heriz are reflected beautifully in this antique Persian Serapi rug. 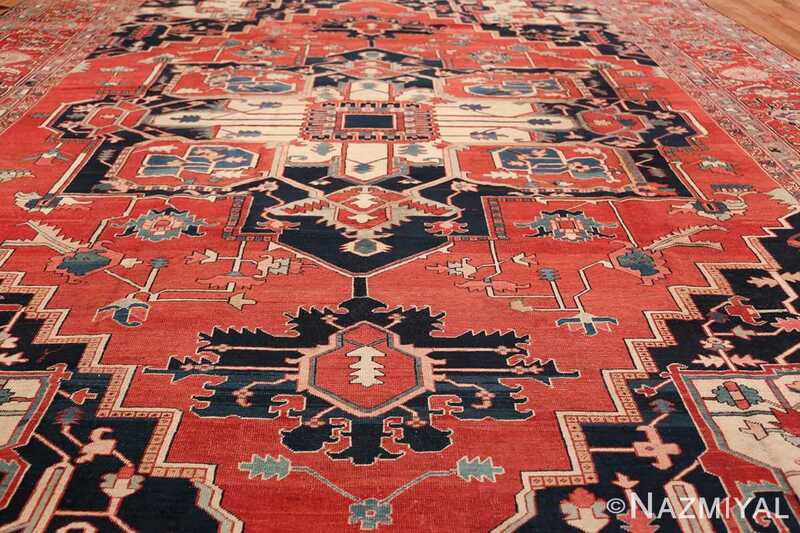 The simple execution of the the large scale geometric motifs retain the tribal rug qualities of the design and reflect the traditions of the unique artistry of the region. 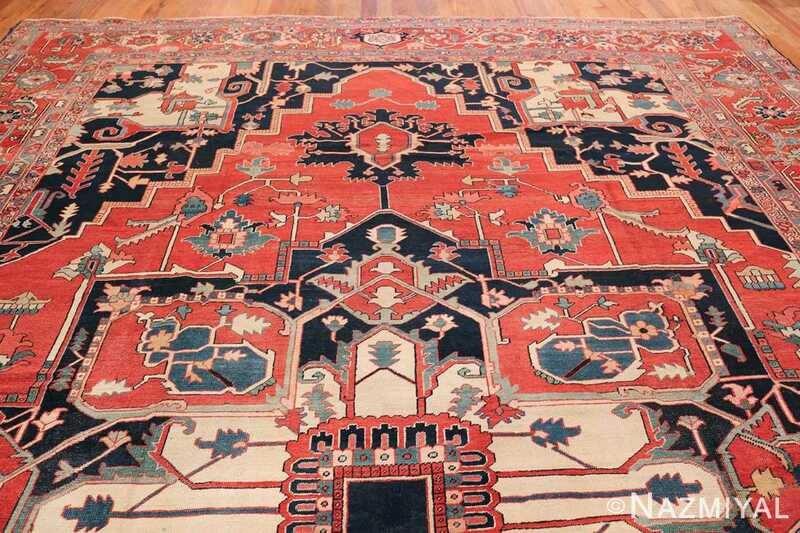 This remarkable antique Persian Heriz Serapi rug uses high contrast colors to set each geometric element of the design apart from its neighbors, yet ties it into the whole beautifully. 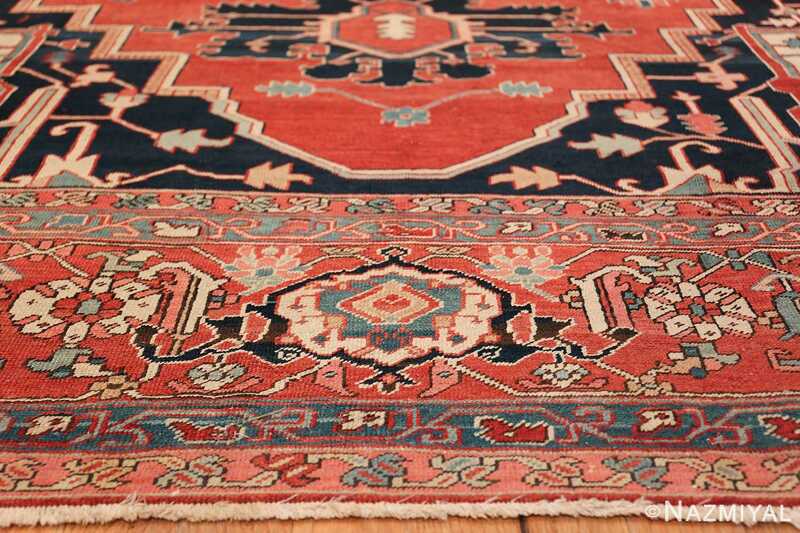 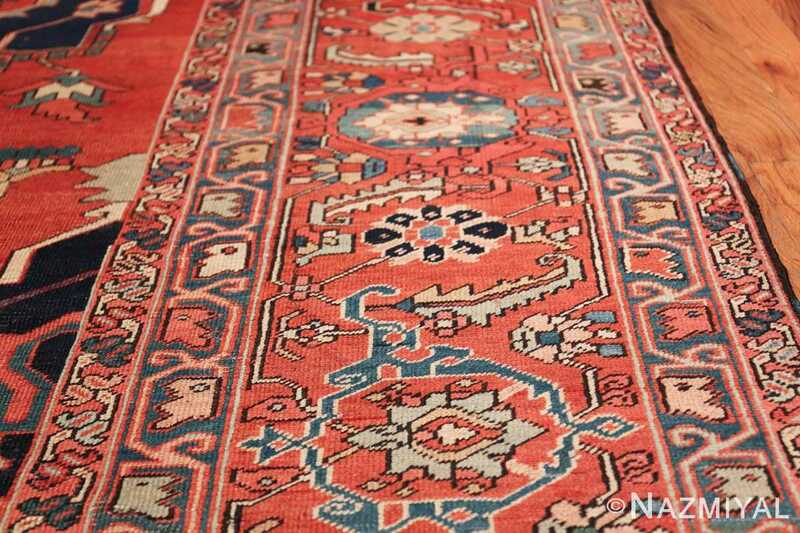 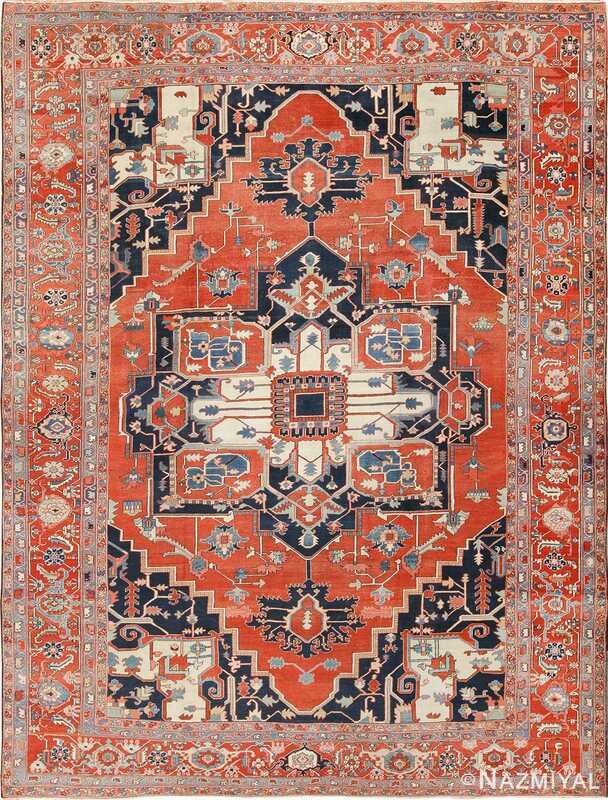 The main dominant background colors of this beautiful antique Persian rug are vibrant rusty reds, navy blue, and ivory. 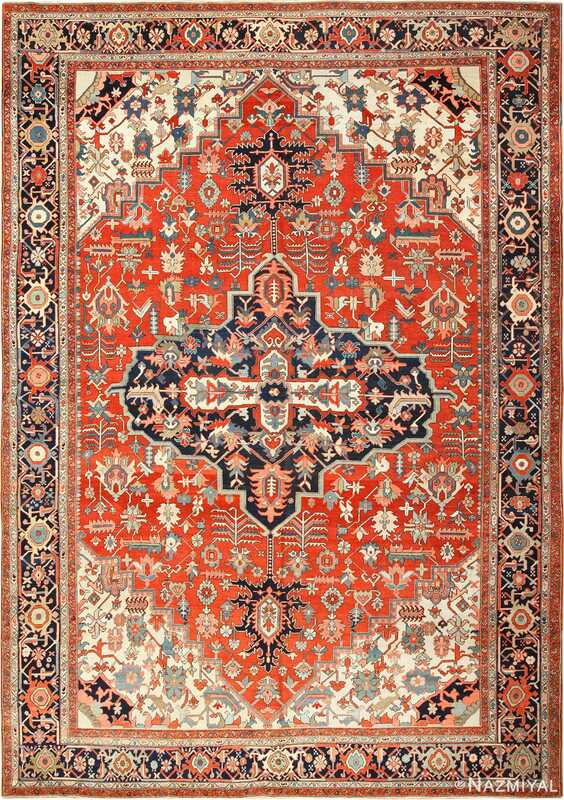 The geometric design, of this magnificent large antique Persian Serapi rug, is carried out using these wonderful jewel tone rug colors while adding coral, light blue, tan and sea foam. These added colors create ever changing interest throughout the field and borders. The shapes are outlined in contrasting colors to highlight them even more. 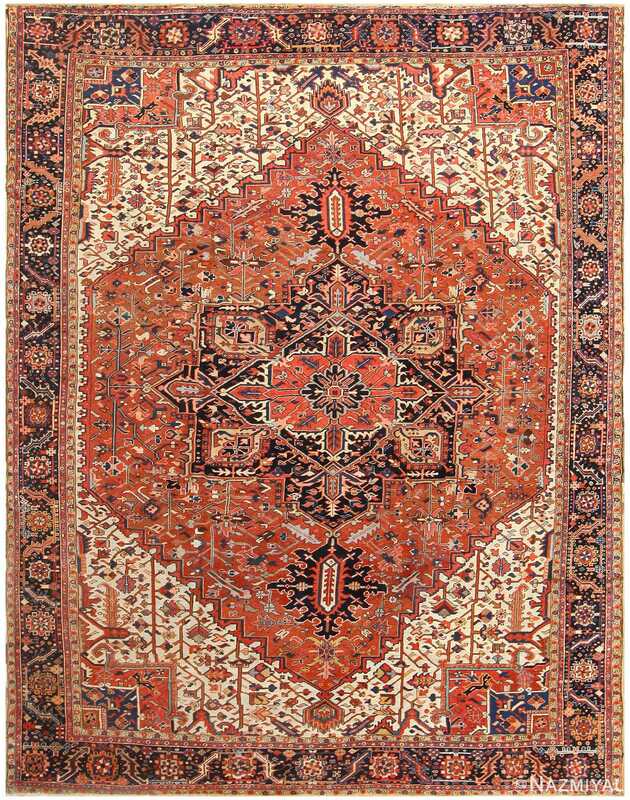 The field design of this wonderful large antique Persian Serapi rug stands out in several ways. 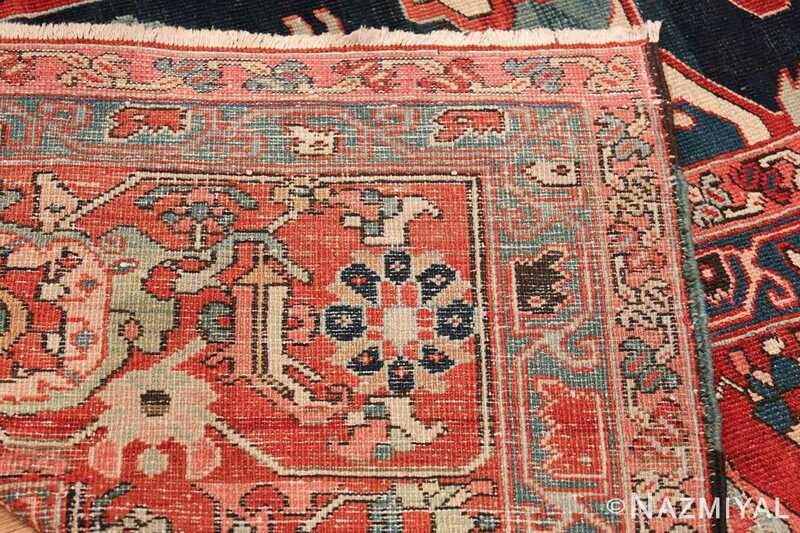 The first is its use of the iconic anchor central medallion. 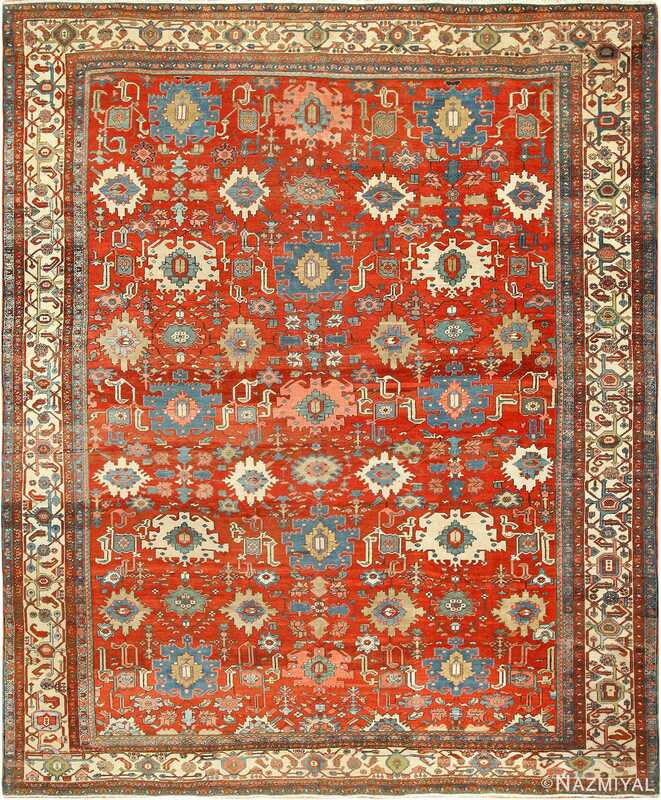 Concentric geometric shapes expand the design to the corners of the field. 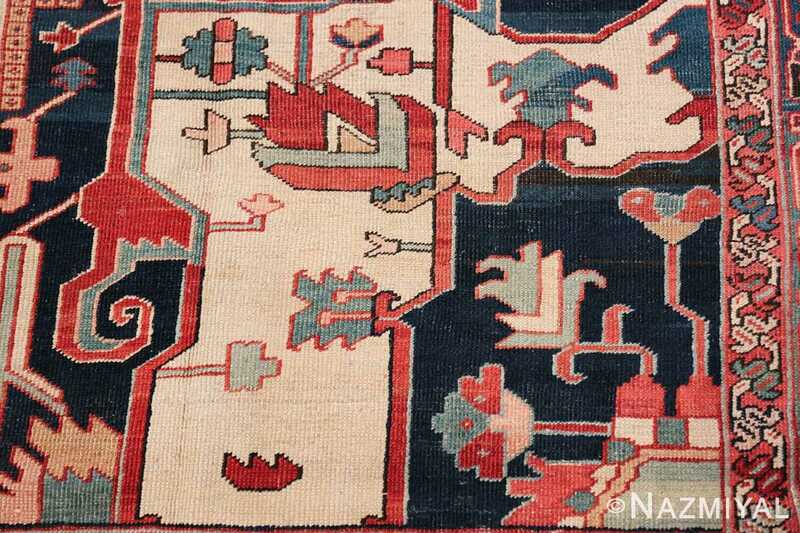 The design motifs in the field are of larger scale than those used in the main border. 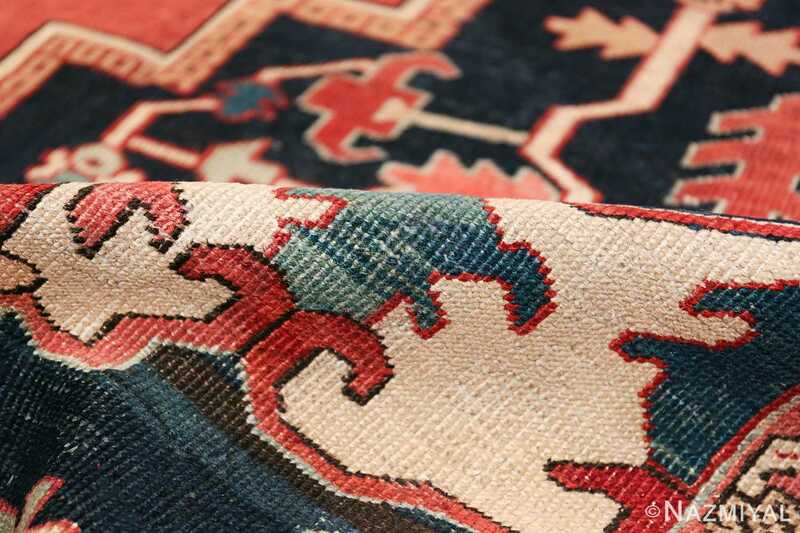 This gives the border a sense of delicateness that contrasts with the broad angular lines of the field design. It creates a balance that gives both the field and main border equal weight within the formal geometric structure. This helps to balance out the boldness of the main field. 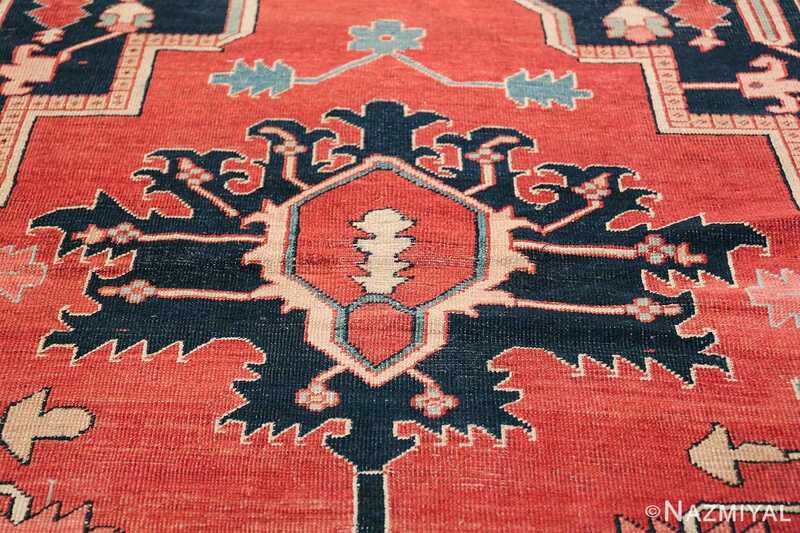 This gorgeous and quite happy rug has both horizontal and vertical symmetry. It could be placed in either direction and has a distinctive central focal point. 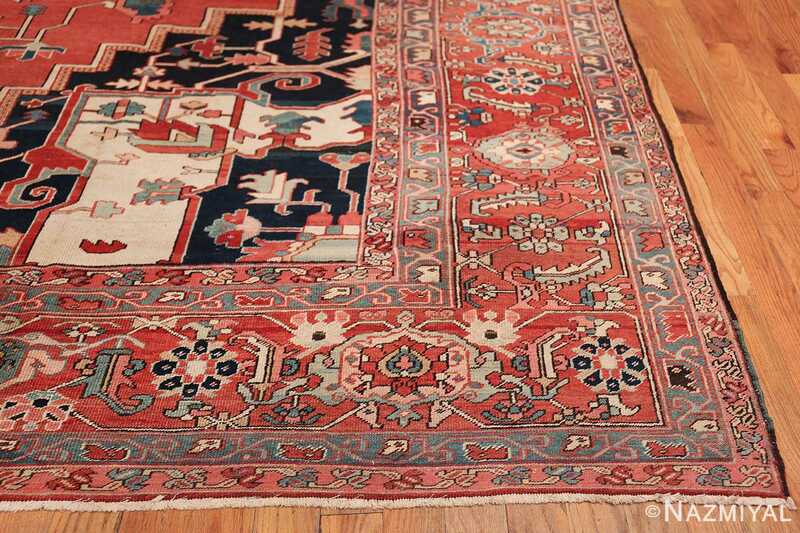 This antique large size rug could be used to define a space in either a traditional or contemporary interior design.